Krishna Engineering Works is a company engaged in Manufacturing, Exporting & Supplying of Air Expandable Shaft, Air Shafts like Mechanical Shaft, Quick Lock Shafts, Multi Tube Shafts, Air Expandable Shaft; Air Chucks, Quick Lock, Safety Chucks.We are Also Manufacturer of Air Pneumatic Shaft winner of 3 times National Award and 2 times International Award for Quality manufacturing. 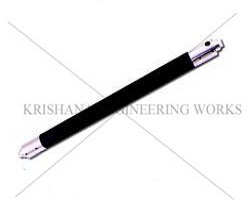 We also make Expandable Shaft with international standard quality. This is a very commonly used shaft. It mainly consists of slotted pipe, journals to suite users machine, lugs, rubber bladder and non-return valve. These types of shafts are suitable for both unwinding and winding stages. It can accommodate single core, multi cores of the width more than 150 mm. Type of pipe material, lug material are decided based on duty conditions like load, speed and core material. The limitations are, it cannot take care of gauge variation or individual core speed variation since slippage is not achieved and core width less than 1 50 mm. Suitable for core ID. 3, 4 and 6 (metric size and special sizes also produced). Length as per your requirement.